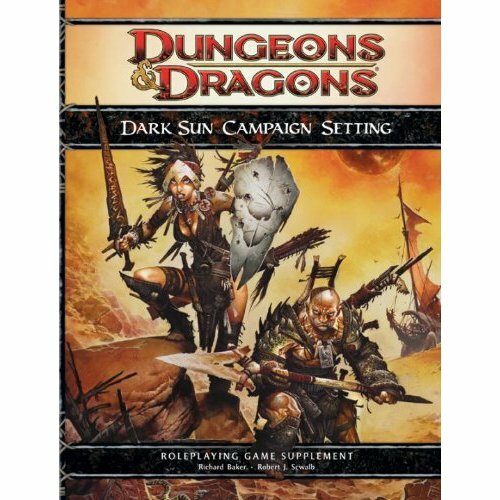 So you’re a newbie DM, and you’re trying to decide whether or not you are going to run a little bit of Dark Sun for your group. Here are a few things you’ll need to keep in mind if you do, as the standard fantasy fare won’t really apply to the world of Athas. And what’s the point of playing in Dark Sun if you aren’t going to give it the feel of the setting? All this is touched on and explained in the book, I am merely highlighting how important it is to follow this in order to give your game the authentic Dark Sun flavor. Athas is a desert. Now would be a good a time as any and take a refresher course on using the Environmental Dangers rules on page 159 of your DMG. Endurance checks, effects of thirst, and rules on weather should be used to help capture the feel of the world, and reinforce to your players that this is a brutal setting. The book also introduces a mechanic called “Survival Days” which is a shorthand way to track and manage supplies for treks out in the desert. There are no gods, so divine characters are not really part of the world. You can make them be if you can come up with a reasonable explanation, but my suggestion would be to leave them out and keep with the feel and flavor of the world. Races have been turned on their heads. There are no rivers, so for example Halflings aren’t water gypsies, but rather an ancient race of nature lovers who have no problem eating other people in order to survive. And elves? They are desert nomads who live off trading and peddling their wares. Keep in mind and read the races material in the book, so your players aren’t taken by surprise when a Halfling tries to eat a PC. Monster selection is also important to give it the flavor of Dark Sun. Stick to reptiles and bugs, for example, along with creatures from the Dark Sun Creature Collection. Lizard folks and elementals are good too. Psionics, psionics, psionics. Psionics affect all living creatures on Athas, so create neat variations of monsters with some that use mind powers and that sort of thing. Telepathy and telekinetic powers are not all that foreign to folks in Athas, so use them liberally in your encounters. Arena fights are a big staple of the setting. So is slavery. Slaves? Arenas? Bloodbaths. Always fun for a DM. So there you go, a quick primer on what an Athas game should look like, in case you are wondering on whether or not you should pick up the book. If you want to try something other than the heavy fantasy of the Forgotten Realms, or the pulp in Eberron, this would be a good option. It throws so many standard D&D tropes out the window that it makes for a fresh take on the game, and that alone makes it worthy in my book. Thank you for the primer too! Awesome little review. Ok. So I have a questions for ya, good sir. As you know I’m a Pathfinder player. Is this book worth anything for me? Is there too much crunch to shift through and convert to Pathfinder? for example Halflings aren’t water gypsies, but rather an ancient race of nature lovers who have no problem eating other people in order to survive. Why would halflings be water gypsies? What setting is that? I like to call them Water Gypsies because in the 4e assumed setting, halfling are river folk. As far as adapting this for Pathfinder, easily done, im sure there are rules there for environmental effects you can use, and perhaps some of the iconic races are open game license races, like the mul and thri keen. You have to be careful with Arcane magic defiling the land. On page 80 of the Dark Sun book, it says, “You are considered to be preserving unless you choose to defile.” So this shouldn’t deter your players from playing their favorite arcane characters. Thanks for that, you are right. It slipped my mind. Alfndrate: The big deal with arcane magic is that in the base setting of Athas, the average person is terrified of Arcane magic (because of defilers). I equate it to a player being a cleric of an evil deity or playing a Drow in a standard D&D game, that player is going to stand out and have to go through extra effort to avoid bringing attention to themselves. I really cannot recommend Dark Sun enough, back in 2E when I started playing it the world and setting were so different and interesting that it felt like an entirely new way of playing D&D. So how does healing work if you can’t have divine characters? Looking in the PHB I do see that water affinity in there, though I never would have picked up on it since I just think “hobbit hobbit hobbit.” I wonder where they got it. Probably a Dragon magazine. Noumenon: In the 4E preview book they talk about why they decided to make Halflings more like water merchants in the base setting, but I’m not a big fan of it so I just have some halflings as water merchants but just as many are the typical hobbit-like or other kinds of halflings. Cap: There are lots of classes that heal without using divine magic – Shaman, Warlord, Ardent, and Bard for example. Bartoneus: Gotcha. Though I think that Warlords still use the Divine keyword, right? So probably just Shaman/Ardents/Bards. Cap: Nope, Warlord has nothing about the class that is divine (unless you want to flavor it that way). It uses the healing keyword, but that has no direct relation to divine power sources. Inspiring Word is just the Warlord’s way of being so powerful a leader that he can get allies to fight beyond their normal means, so Warlords fit quite well into Dark Sun – especially the arena/gladiator aspects. I personally don’t like the idea of playing in a dark sun setting. I like my big metal armor too much. The whole surviving in the desert thing would be cool for a while but eventually I know I’d be dying for a forest or something. meh. Even in this new attempt, it doesn’t really … get me. Or I don’t really get it. Dark Sun is and has always been a Mad-Max type setting tucked on top of system meant for heroic fantasy. Of course it does work, but I would get bored. Desert. More desert. Oh, survival of the fittest, didn’t we have that yesterday? By the way: This idea of “fixing it” is a problem I ahve with most darker settings. I look at them and instinctively think: That’s cool, but how would I go at fixing it? I’ve encountered it with Vampire, Exalted, with the Midnight Campaign Setting or with Warhammer. My biggest problem with all these settings is: While they are cool, they always look like they present a very specific point in the timestream of such a world. This point is chosen to create a sense of overwhelming danger no matter where you go, what you do. The best you can (should be able to) do is delay the inevitable. These settings are all on the verge of a paradigm shift: Normal people can only just survive, but the shift will come. That’s what makes these settings so dark and overwhelming and (IMHO) pointless. The shift WILL come and all will be lost. So why bother? I’m by no means a Dark Sun expert, but I believe that if you wanted to create a campaign where the “end game” is to fix Athas, it is entirely possible. Of course not. But that’s hardly the point of the world. It’s like you’d make defeating Cthullhu the point of a Call of Cthullhu game. My biggest reason for being a fan and promoter of Dark Sun and Athas is because they actually do twist the perceptions and expectations of normal D&D and turn them on their heads… oh.. your dwarf is bald?.. your halfling is a cannibal? .. your wizard is chased out of town by an angry mob and has to figure out how to survive being eaten by giant psychically gifted bugs in the desert and every (almost every) city you visited is ruled by a corrupted nightmare inducing sorcerer king?… cool!!! It is a great change of pace.. if you are thoroughly enjoying your current D&D, Forgotten Realms, Eberon, or homebrew game then don’t drop that and pick up Athas just for the sake of helping WoTC sell some books.. but if you are looking for something different and darker than your average swords and sorcery game (and don’t play White Wolfs range of games) then maybe this is worth a try. Also, I did thoroughly enjoy the Prism Pentad books and all the 2nd Edition Dark Sun adventures and sourcebooks that came out back in the 90’s (and that I still have!) that I definitely have a nystalgia for Dark Sun. But to each their own and if all Dark Sun does is give you a better desert or better wilderness survival rules for your own games, then have at it!